Awards honor excellence in California for engineering, wastewater operations, collection systems, laboratory and pretreatment programs. The California Water Environment Association (CWEA) announced winners of their annual awards program at their Annual Conference in Santa Clara in April. Award winners were chosen from hundreds of applicants. CWEA’s awards program has grown each year to acknowledge outstanding achievement in more than 20 categories honoring exceptional California water environment professionals, collection systems, treatment plants, community outreach and so much more. The program seeks to recognize outstanding achievements within the water environment field, improve the professional status of all personnel working in the field, and stimulate public awareness of the importance of wastewater treatment to public health and the water environment. “The award winners are proven leaders who’ve demonstrated excellence in their careers. I am full of pride and gratitude to work with such dedicated stewards of the public health and the environment.” said Phil Scott, 2015-2016 CWEA President. The award recognizes accomplishments in compliance, innovative practices, cost effectiveness, and superior plant performance. Collection System of the Year recognizes municipalities who protect the public health and the natural beauty of the environment through pro-active practices of management, operations and maintenance including regulatory compliance, safety & training procedures, emergency response procedures, and significant accomplishments including funding and investing in capital projects. Collection System of the Year Small went to (0-249 Miles) Goleta Sanitary District. The Goleta Sanitary District was created in 1942 to provide wastewater collection and treatment services for the Goleta Valley. Today the District’s 132 mile long network of underground pipes deliver approximately 4 million gallons of waste water to the District’s award winning treatment plant every day. At the facility waste water is treated and cleaned to very high standards by certified staff before being reused for irrigation or discharged safely into the ocean. Collection System of the Year Medium (250-500 Miles) went to the City of Merced. The Wastewater/Sewer System Division is dedicated to protecting public health and the environment by the cost effective operation and maintenance of the Wastewater Collection System infrastructure consisting of over 260 miles of pipe ranging from 6 to 48 inches. The Wastewater Collection Division conveys an average dry weather flow of approximately 7.2 million gallons a day (MGD) from homes and businesses to the City of Merced Wastewater Treatment Facility. Collection System of the Year Large (Over 500 Miles) went to Irvine Ranch Water District (IRWD). IRWD has provided sewage collection services to Orange County residents for over 50 years. The District currently manages more than 1,000 miles of sewer pipeline, operates 2 recycled water facilities with a combined treatment capacity of 35 million gallons per day and maintains approximately 97,000 sewer service connections. The District cleaned more than 660 miles of sewer pipeline last year. CWEA also recognizes individuals on the Collection System category for their demonstration of innovation and excellence in the performance of collection system maintenance. The Electrical/Instrumentation category recognizes significant contributions to the electrical and instrumentation field related to wastewater treatment and contributions to CWEA. This year’s Electrical/Instrumentation Person of the Year went to Casey Larsen of San Elijo Joint Powers Authority. The San Elijo Joint Powers Authority (SEJPA) protects the environment and public health by treating and recycling wastewater from the coastal cities of Del Mar, Encinitas, Solana Beach, and portions of Rancho Santa Fe. One of Casey’s accomplishments included the development of a program to automate aeration system for the activated sludge system to optimize energy use based on DO set points. This work was paramount to the overall project which is currently saving 900,000 kWh of energy each year. Engineering Achievement award recognizes outstanding achievements in engineering by individuals, groups, or companies. This year’s Engineering Achievement was awarded to Santa Margarita Water District, Gobernadora Multipurpose Basin. The Gobernadora Basin project consists of a storm detention basin and a natural treatment system, a system to capture and divert flows to the wetlands, a pump station, and a pipeline to deliver flows to the Portola Reservoir, a recycled water reservoir located in Coto de Caza. The District is also connecting the Gobernadora transmission system to the Chiquita Water Reclamation Plant to deliver recycled water to the Portola Reservoir. The Research Achievement award recognizes outstanding achievements in research by individuals, groups, or companies. City of Los Angeles Bureau of Sanitation, Terminal Island WRP Advanced Water Purification Facility Expansion Project Advanced Oxidation Process Bench and Pilot Testing took home the Research Achievement award. The main goal of this study was to establish the most reliable and cost effective Advanced Oxidation Process (AOP) to achieve disinfection credits and chemical removal in order to ensure and protect public health. The Kirt Brooks Memorial Water Environment Scholarship is a scholarship for students in or interested in the water environment industry who are members of CWEA or sponsored by CWEA members. CWEA’s Scholarship Fund provides annual scholarships ranging from $500 to $5,000 to students. Seven scholarships were awarded for the 2016-17 school year, totaling $20,000 at the Annual Conference in Santa Clara. CWEA’s Laboratory Person of the Year award recognizes significant personal contributions that have advanced the field of laboratory analysis of wastewater. Criteria includes outstanding research, professional development, contributions to laboratory management, and CWEA activities. The winner of this award is also nominated at the national level with the Water Environment Federation (WEF). This year’s Laboratory Person of the Year went to the City of Modesto’s Scott Jacobs. Scott is a Lab Analyst III with the City of Modesto’s Wastewater Division and has been employed with them since 2009. A Mechanical Technician is awarded for outstanding performance, dedication to the job, and for sharing knowledge of maintenance procedures. Dominic “Bruno” Bronozzi of Olivenhain Municipal Water District (OMWD) (Encinitas) brought home the award this year. The award was presented in recognition of Mr. Brunozzi’s outstanding contribution to wastewater plant and system maintenance, the development of equipment and significant process modifications to provide for more efficient work flow, and special efforts in the training of OMWD operators. The 2015 Operator of the Year was awarded to Walter Walsh of Silicon Valley Clean Water for his outstanding contributions to the operations of wastewater treatment plant facilities and application of knowledge to improve plant processes. Also awarded from Silicon Valley Clean Water was Susan Hiestand, Pollution Prevention Specialist as the Community Engagement and Outreach Person of the Year. Susan educates the community about pollution prevention, visiting local schools and scheduling and leading tours for individuals and groups. One of her accomplishments was creating the award winning “Dockwalkers” campaign to “Save Our Shores,” designed to educate boaters in the Monterey Sanctuary about the effect of oil on the ocean. This program subsequently spread to marinas throughout California in an effort by the Coastal Commission and the Department of Boating and Waterways to education boaters. Pollution, Pretreatment Prevention and Stormwater (P3S) Person of the Year went to Mary Jo Ramey of Central Marin Sanitation Agency. Mary Jo was recognized for making significant personal contributions to the field of Pretreatment, Pollution Prevention and Stormwater. Mary Jo is an Environmental Services Analyst. Orange County Sanitation Agency (OCSD) took home the Plant Safety, Large award. OCSD’s mission is to protect public health and the environment by providing effective wastewater collection, treatment, and recycling. 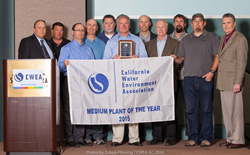 Plant Safety, Medium was awarded to Encina Wastewater Authority (EWA) (Carlsbad). EWA has complex infrastructure that enables the agency to clean and repurpose sewage into a vibrant, healthy and potent fertilizer known as PureGreen; to recapture methane gas and turn it into electrical energy known as PureEnergy; and to filter, purify and reuse water from the sewage lines into PureWater for irrigation and equipment operations. EWA was also the highest scoring Plant Safety plant of all the winners and was awarded the Water Environment Federation George W. Burke Award recognizes a municipal or industrial wastewater facility for establishing and maintaining an active and effective safety program. The purpose of this award is to encourage an active and effective safety program in municipal and industrial wastewater facilities. Plant Safety, Small went to City of Los Angeles, Department of Public Works, Glendale Wastewater Reclamation Plant. The LA Glendale Water Reclamation Plant is the smallest of the City of LA’s 4 wastewater plants. It was the first water reclamation plant operated by the City and currently processes 20 million gallons of wastewater per day. The plant has an excellent safety record and is a previous winner of this safety award. The Community Engagement and Outreach award recognizes significant achievements in promoting awareness and understanding of water quality and environmental issues among the general public. Selma Kingsburg Fowler County Sanitation District took the award home for the Small category with a budget under $20k with their Open House. The Open House featured facility tours showing the public how Selma Kingsburg Fowler is protecting the environment and doing their part in returning clean water to the ground water. Supervisor of the Year is awarded for exemplary organizational and personnel skills. It recognizes successful mentoring of subordinates, professional development, and effective communications between staff and management. Nick Becker of Napa Sanitation District’s Collection System Department received the Supervisor of the Year Award for demonstrating outstanding leadership, excellent communication skills and a commitment to safety. Nick Arhontes, recently retired from Orange County Sanitation District in Fountain Valley was the recipient of the Waster Environment Federation Arthur Sidney Bedell award which recognizes organizational leadership, administrative service, membership activity, stimulation of technical functions, or similar participation. The Water Environment Federation (WEF) Quarter Century Operators Club must have demonstrated significant full-time participation in the water environment profession for a minimum of 25 years, 10 years of which must have been in active participation in the day-to-day collections, maintenance, operations, laboratory, or management of a wastewater transportation or treatment facility. This year, WEF recognized Polly Villarreal of East Bay Municipal Utility District in Oakland. Polly is also a CWEA board member and the chair of the Northern Regional Committee. She has been with East Bay MUD for 25 years as an Wastewater Operator.